April 26th 1899 – 37 – Prominent citizens from Goshen and Middletown establish Orange County Golf Club. Annual Dues were $10 for individuals and $25 for families. May 18th 1899 – Congressman Henry Bacon the clubs first President hires John D. Dunn to visit and layout the course’s nine holes. The course measured just over 1900 yards with holes ranging from 126 yards on seven to 300 yards on three and nine. May 30th 1899 – Orange County Golf Club members meet at 10 AM Memorial Day to formally open the course for play. 1902 – Membership is now more than 100 and the Middletown – Goshen Traction Co. installs a trolley station at the golf links, which operates until the company goes out of business in 1925. 1910 – The first Club Champion, Olin S. Fellows, is recognized in the minutes. The hiring of the first caddy master is completed and the caddy rates are 25 cents for 9 holes and 40 cents for 18 holes. The board of governors discuss whether a dime is too much of a tip for the caddies. 1912 – The club raised $1,200 to lengthen some of the holes and the first professional greenkeeper is hired. 1915 – The Orange County Golf Club Realty Company members give their stock and deed to the club, and the corporation now owns the course. With the clubs financial obligations reduced, the Board expands the clubhouse at a cost of $7,000. Membership reaches 413 by 1929. 1925 – Membership reaches 370 and the course is jammed. A decision to expand the course to 18 holes is reached. Land is purchased across the Wallkill River. The current suspension bridge is completed in 1928 and the second nine is opened for play. 1929 – The Wall Street crash rattled the golf club, membership stopped off and income declined. By 1935 the membership reached 159 and the club declared bankruptcy. 1935 – The U.S. District court approved a reorganization plan. When the reorganization was completed the club instituted an active recruitment campaign. The start of WW II impacted the effort and by 1943 the clubs membership was down to 109. 1949 – When peace returned to the country, so also did the members to the Club. Orange County Golf Club celebrated its golden anniversary and the membership was 300 strong. By then the caddie rates had climbed to $1.50 for 18 holes and 90 cents for 9 holes. 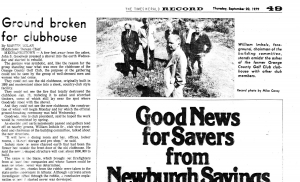 1955 – Floods devastated the county and the course did not escape the raging Wallkill river. Number 11 green was washed out, the lower part of the front nine was drowned and the river came within a foot of the river bridge. Only the tip of the flag on number 1 was visible. 1956 – Thirty years after it was proposed the club approved a swimming pool for the club. Use of the pool increased dramatically over the coming years. 1957 –On Sunday July 14th current club champion Harry “Bub” Meola shot a course record 69 becoming the first amateur to break 70 on the course. The former record of 70 set by John H. Morrison Jr. in August 1940 and later tied by several members had stood for 17 years. A year later the record was tied by Paul Priest and subsequently by Vinny Brown in 1959 and again on July 20, 1973 by Charlie Van Gelder. 1979 – Disaster struck the clubhouse on Friday January 12, 1979. State troopers on duty spotted a mass of flames fed by a ruptured natural gas line. The flames could be seen for several miles. Nobody was injured but the fire leveled the clubhouse within a half-hours time. Planning for a new clubhouse began immediately. 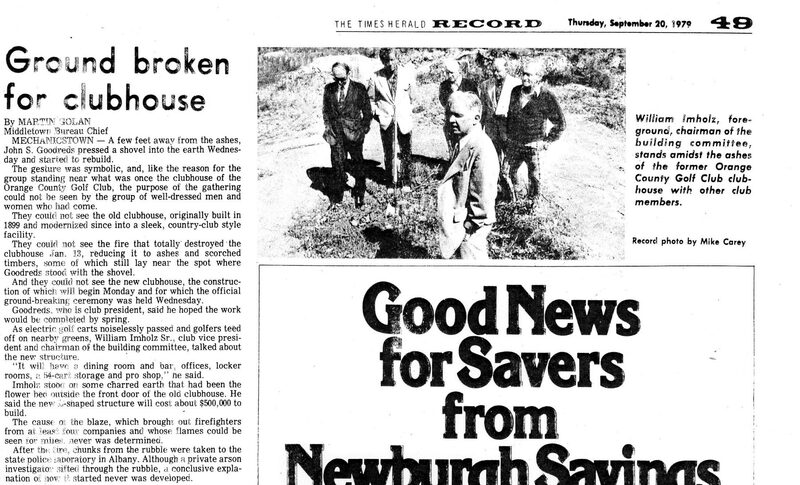 The board approved a 12,000 square foot building and the inaugural opening of the new clubhouse was completed on May 25, 1980 less than 17 months from the date of the fire. 1982 – On August 20th a new course record of 65 was set by Frank McBride Jr., Ken Cohen tied the record during an IKE qualifier in 1986 and in April of 1997 was tied by Taylor Walsh, then a junior at Ellenville High School and son of pro Geoff Walsh. 1991 – Archeologist began taking some divots in the fairway between number one and eleven. During environmental impact tests researchers discovered 5,000 year old Indian pottery, arrowheads, spearheads and fishnet sinkers. The archeologists continued their daily routines with golf balls flying overhead and promised to restore the fairways to their original condition. 1996 – After the fire of 1979 the clubhouse featured a large patio on the southeast side of the building. The patio was home to many outings and events and was covered by a tent to deter the elements. By 1996 the cover was seriously deteriorating and the board discussed several options. At a special membership vote on April 29, 1998 the membership voted for a full addition to the clubhouse, which is now the centennial room that highlighted the centennial celebration in 1999. 2003 – The success of the centennial room inspired the membership to continue improvements of the clubhouse, which included a new patio off a completely renovated formal dining room, new locker rooms and a remodeled pro shop. The renovations were completed in May of 2004 and the response from members and guests was excellent. 2009 – The Membership voted to change the clubs name to Orange Country Club. 2012 – The Orange County Golf Club is being reborn as the “NEW” West Hills Country Club. Bonura Hospitality Group, operators of high profile food and beverage venues throughout the Hudson Valley, including Anthony’s Pier 9, The Grandview, and Shadows on the Hudson is completely transforming the facility into one of the best private golf and country clubs in the region. 2013 – The multi-million dollar renaissance of the new West Hills Country Club is nearly complete, transforming it into one of the premier golf and country club facilities in the region. The new West Hills Country Club is not only mesmerizing for our club members, it has become the most exclusive venue for wedding couples as well. Exciting developments such as new tennis courts, redesigned pool, outdoor bar and cabanas creates a decidedly elegant touch. The expanded and remodeled clubhouse, restaurant and new menu takes the country club experience to a new level. And our gorgeous new outdoor banquet facility with stunning views of the golf course nestled alongside the Wallkill River creates an unrivaled wedding experience that won’t be forgotten. 2015 – The multi-million dollar renaissance of the new West Hills Country Club is complete. West Hills Country Club has opened a brand new 9-hole, Par 3 golf course named the “River Course.” The River Course has been rated for both Men and Ladies, playing to an overall par of 27. Designed with all levels of golfers in mind, beginners and experienced alike will enjoy the choice of playing a shorter course while building confidence in their overall game. Families will be able to enjoy their outing without the stresses of faster groups behind them. Kids will now have the opportunity to learn the game the way it was meant to be learned, from shorter shots to longer drives. The River Course can accommodate 3 different sets of tees and ranges from 76 yards to its longest hole of 240 yards, giving each player the challenge they are looking for.